Of course, there’s more than the unemployment rate to consider. Jobless claims have been ticking upward of late. Retail and manufacturing is weakening. The housing market is still flailing along. Plus, Fed officials will have to consider whether Europe still poses a threat to the U.S. recovery. But the [CFR] graph lays the choice out starkly. If the rough patch in May wasn’t just a blip, then the Fed will be failing to achieve its own stated goals for unemployment. It’s past time for the Fed to do something about this, and it’s not just Paul Krugman saying so. 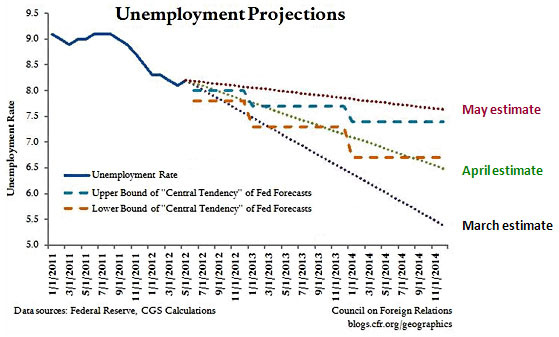 The Fed’s own forecasts are saying it too.